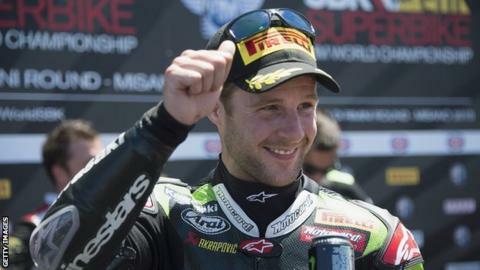 Jonathan Rea still enjoys a healthy 125-point lead at the top of the World Superbike Championship after finishing third in both races at Laguna Seca. Welshman Chaz Davies took two start-to-finish wins at the Californian circuit, with Tom Sykes twice finishing second. Ducati rider Davies made it three wins this season and seven career victories in the series with a dominant display. Rea took his worst results of the season to date but remains in a strong position to secure the title. Davies started from pole position and never looked like relinquishing the lead in either of the 25-lap races. The 28-year-old had a 1.8-second advantage over Sykes at the chequered flag in race one, with the Yorkshireman's Kawasaki team-mate Rea occupying the final podium spot. The trio finished in the same order in the second event, with Davies 1.4 seconds in front at the end of the race. Davide Giugliano, Jordi Torres and England's Alex Lowes completed the top six in the opener, with Leon Haslam salvaging 13th position after falling off and then re-mounting. Torres improved to fourth in race two, with Haslam fifth on his Aprilia. Rea leads the championship standings on 407 points, with Sykes second on 282 and Davies third on 263, ahead of the 10th round of the series in Malaysia in two weeks' time. "Two third places represent two good results for my championship hopes and the title is now in sight," commented Northern Irishman Rea. "I'm really happy because we struggled a bit with the set-up of the bike this weekend. We pushed hard but we just had something lacking with regard to challenging for race wins."